In order to study composite behavior, the National Science Foundation (NSF) has announced a USD 545,000 grant over three years to Penn State researchers. Understanding the behavior of composite materials is important to advancing their design, since attempts to further strengthen or stiffen them can sometimes produce counterproductive results. This funding aims to answer some of the central questions about the microstructural mechanisms that lead to composite performance. Michael Hillman, L. Robert and Mary L. Kimball Assistant Professor of Civil and Environmental Engineering at Penn State and principal investigator on this project, has partnered with Jing Du, assistant professor of mechanical engineering at Penn State, to combine experiments and simulations in order to study composite behavior. Their focus will be on polymer-ceramic composites. Composite materials, made from combining two or more materials, are used in everything from buildings to aircrafts because of their unique ability to provide high strength- and stiffness-to-density ratios. But even though their use is widespread, it is still difficult to characterize their strength and the factors that contribute to it for each material. A new computational approach called the continua-discontinua particle method (CDPM) hopes to shed light on this problem. CDPM combines the strengths of two numerical methods commonly used to simulate fracture, the traditional continuum-based method and the discrete approach. 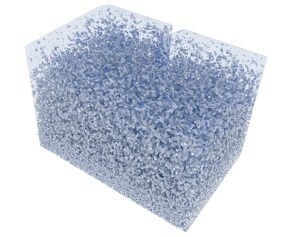 The discrete approach consists of simulating material and structural behavior using a large number of small particles. In this method, a pre-existing network of particles is bonded and then the bonds are cut to simulate a fracture. This method allows the simulation of very complex fracture patterns, but has some inherent shortcomings in simulating the deformation under certain loadings and types of failure. According to Hillman, the continuum method focuses on the mechanical behavior of materials modeled as a continuous mass rather than as individual discrete particles. Modeling an object as a continuum means that fractures need to explicitly be introduced into the system, thus limiting the ability to model complex fracture. Co-principal investigator Du will use micro X-ray computed tomography (micro-CT) to obtain images of the material. A machine learning-assisted process is then used to reconstruct the 3D geometry of the microstructure in order to provide a model to simulate the mechanical behavior of the material. This image-based computation will allow a representation and modeling of the actual material flaws, as well as the form and structure of the specimens that were physically tested. Afterward, a one-to-one comparison of the metrics obtained in the simulations and physical tests can be made for validation of the computations. Other testing methods will include tension testing, nanoindentation (indentation hardness test) and scanning electron microscopy to compliment the mechanical tests. Once validated, the method will be used to perform numerous numerical tests that would otherwise be impractical to perform physically, to predict structure-property relations of these materials. These predictions will be further validated with an experimental series of tests designed using the computational results. The researchers hope that once they develop a successful model for polymer-ceramic composites they can then apply the technology to understand how other composites perform and even apply it to newly developed materials to lessen the time it takes identify the best material designs. Other researchers include Anna Madra, postdoctoral researcher in civil engineering, and Kangning Su, graduate student in mechanical engineering.